Designed to a specification for a heavy bomber first issued in 1932, the first Wellington prototype flew in 1934. It was the second airplane to use the revolutionary geodetic construction system first created by Barnes Wallis for the R-100 airship in the early 1920s. This lightweight construction method made the resulting airplane extremely strong and resistant to structural damage, which was greatly appreciated by crews during the Second World War when the Wellington returned with battle damage that would have downed any other airplane. During structural testing performed at the Royal Aircraft Establishment, Farnborough, the proposed structure demonstrated not only the required strength factor of six, but reached 11 without any sign of failure, proving the geodesic airframe to possess a strength far in excess of normal levels. This strength allowed for the structure design to be further developed to reduce the size of individual members and adopt simplified standard sections of lighter construction. The geodetic construction allowed the weight of the airplane to grow from 21,000 pounds to 36,500 pounds with no major change in the basic airframe. On 5 June 1936, the name “Crecy” was initially chosen for the type, and it was publicly displayed as such. The aircraft was accepted for production on 15 August 1936, however, on 8 September 1936, the name “Wellington” was adopted with the explanation that it followed the tradition set by the Vickers Wellesley of possessing names referring back to the Duke of Wellington. The prototype, K4049, first flew on 15 June 1936 from Brooklands, with Vickers chief test pilot Joseph “Mutt” Summers accompanied by Barnes Wallis and Trevor Westbrook. It was soon regarded as an advanced design for its era. K4049 was destroyed on 19 April 1937, by an accident during a service test flight by Maurice Hare, caused by the failure of the elevator horn balance due to excessive slipstream exposure, leading to the aircraft going inverted and diving into terrain. The Wellington was ordered into production in 1936 and entered service in 1938. The Wellington was initially outnumbered by the Handley Page Hampden and the Armstrong Whitworth Whitley, but outlasted both rival aircraft in service. The Wellington was one of five British aircraft in first line service at the outset of the war that were still in first line service at the end. The two major sub-types of the Wellington were the Mk. IC and the Mk.III, though the Mk. X - a Mk.III with Bristol VI or Mark XVI engines and a change in the the geodetic framework to new lighter alloys - was the type most-produced, with over 3,500 coming out of the factories between 1943 and the end of the war. Production from the three factories totaled 11,461,making the Wellington the most-produced single bomber type used by the RAF. On 4 September 1939, less than 24 hours after the commencement of hostility, 14 Wellingtons of No. 9 and No. 149 Squadrons, with 14 Bristol Blenheims, performed the first RAF bombing raid of the war, targeting German shipping at Brunsbüttel. They did not bomb the harbor itself, since this was not permitted by the Chamberlain War Cabinet for fear of injuring civilians. The effectiveness of the raid was diminished by a combination of poor weather and high amounts of anti-aircraft fire. During this opening raid, a pair of Wellingtons became the first aircraft to be lost on the Western Front. On 18 December 1939, 24 Wellingtons of 9, 37 and 149 Squadrons flew a mission against the German fleet and naval bases in the Schillig Roads and Wilhelmshaven. The Wellingtons were unable to deploy their bombs as all vessels were in harbor and the restrictions on endangering civilians prevented their engagement. Alerted to the formation by radar, Luftwaffe Bf-109 and Bf-110 fighters intercepted the incoming bombers near Heligoland. In what came to be known as the Battle of the Heligoland Bight, they continuously attacked the formation on its the way home, shooting down 12 and badly damaging another three. With this demonstration that a bomber formation could not penetrate defended enemy airspace in daylight, and Bomber Command was directed to make all future attacks by night. In addition to its outstanding work in the European Theatre, the Wellington served with distinction in the Middle East and the China-Burma-India Theatre. It also became a major workhorse for Coastal Command in the antisubmarine war during the Battle of the Atlantic. 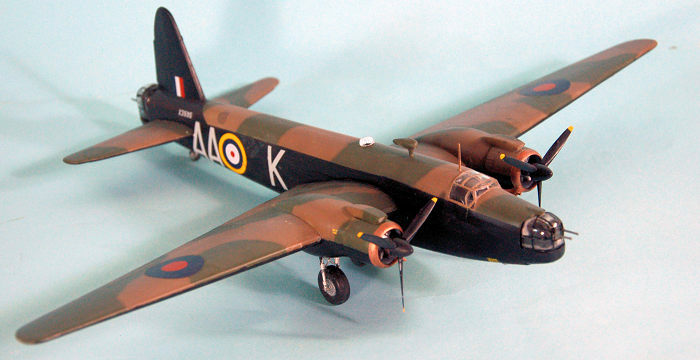 Airfix first produced a Wellington in 1/72 around 1958, as I recall buying and building my first one then. 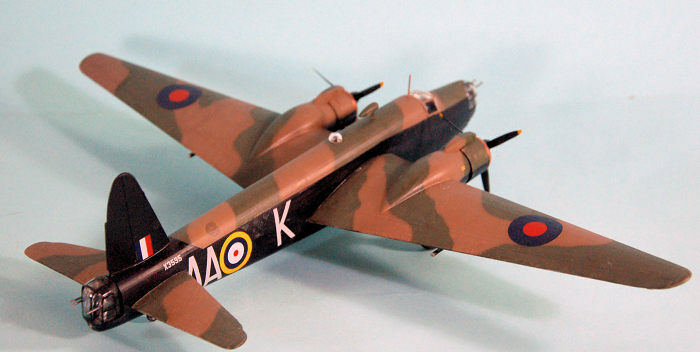 Modelers (including Rod Serling, creator of “The Twilight Zone”) liked it and it was the standard kit for around the next 40 years, until MPM/Special Hobby began releasing the Wellington in several of the major versions in the late 1990s. Trumpeter also released a Wellington IC and III around 2005, in both 1/72 and 1/48 scale; the main complaint about these kits was “overemphasis” of the geodetic construction. This Wellington Mk. X is re-release by Italerei of the MPM kit; it includes the different props, engines, and fuselage windows to make a Mk.IC and a Mk.III. Decals are included for four different aircraft. Overall, construction is very straightforward, other than dealing with the side windows question. The kit includes clear glass for this, and also a solid part that has a continuation of the “fabric effect” for use with the Mk.III and Mk.X options. The problem here is the gaps in the poor fit, which means one must apply gap filler, and then find a way to sand it smooth without losing the detail. I took care of this by applying Tamiya Thin Cement to the gaps, then after that set, I applied cyanoacrylate glue for filler, being careful to wipe away all of it that wasn’t in the gap, then covering that with carefully-applied Mr. Surfacer 500, which I sanded down with some medium wet-or-dry wrapped around a paintbrush handle. Fortunately, if you do a night bomber, this area is black, and thus not so obvious, but it takes a careful hand to get it to an acceptable point. My other difficulty was that the instructions and illustrations were vague about where the exhausts went, and I managed to get the left wing exhaust on the wrong side - I managed to find photographs that showed proper placement, but by then the mistake had been made. Carefully cutting the cowling away from the cowling flaps, I was able to rotate the cowling and get the exhaust on the proper (inner) side. The cockpit is painted black, so the detail provided by the kit is sufficient, since the clear parts are a bit thick with resulting visual distortion. There is a similar problem with the turrets; in addition, they are multi-part and just asking to have a mistake made with the application of glue. The one mistake I made there is fortunately not so apparent when the completed model is displayed. I carefully hand-painted the framing for the turrets with a 00000 brush, and masked the cockpit canopy and waist windows with Tamiya tape. I had considered painting the fuselage, wings and tail separately before further assembly, but when test-fitting these parts it became apparent there was going to be work necessary on filling gaps in the joints, so I assembled the entire model before painting. I painted the upper Dark Earth/Dark Green camouflage, then masked that off and painted the lower surfaces with Xtracrylix “Night,” which is a shade of black slightly greyed-out; it’s not that apparent in the photos, but is noticeable when the model is viewed in person. 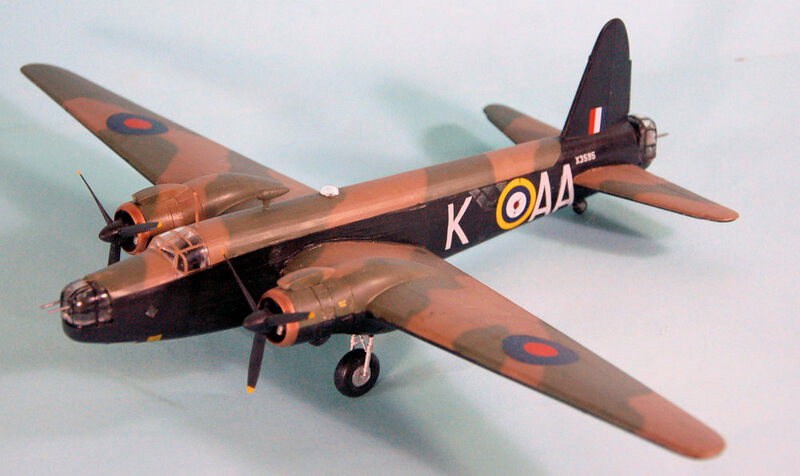 I used the kit-supplied decals to do a Mk.XIV operated by 75 (RNZAF) Squadron in the spring and summer of 1943, the end of the Wellington’s first-line service with Bomber Command. I applied a coat of clear flat to the upper camouflage, and clear satin to the black areas. I then painted the collector ring and exhausts and attached the wheels and props, after unmasking the clear parts. I mounted the turrets at this point and discovered that the rear turret doesn’t fit entirely right. With some fiddling, it now looks acceptable. In terms of “look”, the MPM kits are superior to the Trumpeter kits, since their surface detail is not overdone. However, most Wellingtons had their bomb doors open on the ground, something one can do with the Trumpeter kits but not this kit. However, the new Airfix Wellington beats them all in buildability and detail. This kit is acceptable in terms of price if you find it on a dealer’s table or at a LHS sale, as I did.